We were out of school for the summer. I think I was about nine, and Margie was eleven. Ola and Jeanie no longer lived with us. My mother and daddy were at work all day, and my brother Junior was supposed to take care of Margie and me. That was a joke. He actually thought he was going to boss me around. I still hated him just as much as ever. I think it was because Mother thought he was perfect and could do no wrong. Margie had always been her favorite, too, so there I was stuck between two brats, and I hated them both. I guess they hated me, too, but I didn’t care. I really missed her when she moved. I cried a lot when I would start to think of her. I really loved her. I guess I loved her more than my mother because she was always so good to me. She would play games with me and hug me. She got me ready for school and made my lunch. She was the one who was there when I got home from school. When I was real little, she would rock me and sing to me. And when she would put me to bed, she would kiss me goodnight and say, “Go to sleepy, little Ruthie.” Yes, I really loved her, and I wished she were still living with us. But, she wasn’t. I was stuck with my brother Elmer Junior. Ola had been gone for quite some time. She married Jim, and they lived in their own house. I loved Ola, and she protected me from Junior, too, but it was different from Jeanie. I was constantly trying to figure out a way to save my life. I told my mother on him, but she thought he did no wrong so I was on my own. I would just take each day as it came and pray to Jesus that he didn’t kill me. He wasn’t too bad on Margie because she was sick a lot with earaches. Plus, he knew Mother would believe Margie if she told on him. One hot afternoon, he locked us out of the house, and it gets really hot in Oklahoma in the summer. We were beating on the door and begging to get in even though it was hot in the house, too. We sure didn’t have air conditioning back then; we didn’t even have a fan! But, it was a little better in the house than outside in the blazing sun. I guess we were as poor as church mice. I never realized it so much before, but we must have been real poor if we didn’t have a fan in the summer to cool off. One day when we were with Junior, and he was supposed to be watching us, Margie and me got into a big fight about our paper dolls. We were sitting on the bed playing, and she tore one of my doll dresses right in half. I could feel myself getting hot and mad. I knew I was going to punch her. I tried not to, but what else could I do? I grabbed a bunch of her paper dolls and started to rip them up. Then, I grabbed her pigtails, pulled her across the bed, and doubled up my fist. Then, I really let her have it. She started to scream and cry. The next thing I knew, Junior was there trying to pull me off her. I started hitting him, too. He could do it, too, because he was bigger and stronger than I was. So, I stopped. Then Margie picked up a handful of torn up paper dolls and threw them at me. That was when I felt something hit the back of my head, and it didn’t feel like paper. I reached back to feel what it was. Nope, it wasn’t paper. It was one of my mother’s real small crochet hooks. I told Margie and Junior it was stuck in my head down close to my neck. Junior looked and tried to get it out, but the little hook would not come out. Margie started crying, not because she felt sorry for me but because she thought I would tell Mother, and she would be in trouble. So, my brilliant brother told us to walk around the neighborhood to see if someone could get it out. We went to see Mrs. Frank first. She was a real nice lady who gave us candy sometimes. She tried and tried, but it would not come out. So, we went to see Mrs. Baker who lived next door. Margie was still crying and crying. I was not crying. I was just hoping that someone could get it out. She knew my promises were not too good, so she made me double promise and told me she would help me with my chores on Saturday. That sounded good to me, so I agreed. Well, Mrs. Baker was not home, but Anita, her daughter tried. When she couldn’t do it either, she told us to go home and call Mother at work and tell her what happened. So, we went home, and I dialed the number at the Downtown Cleaners where she worked. I said, “I was taking a nap and rolled over on it.” Margie had a look of relief on her face. Mother told us to walk to 23rd Street to the doctor’s office and she would leave and meet us there. She had to ride the bus there. We went back home to tell Junior what we were to do. “I’m not walking all the way to 23rd Street!” he said. That was our great babysitter! I said, “I don’t care what you do!” What a jackass! I just hated him. So, off we went to the doctor. I was holding up the hook in my head with my left hand, and Margie was holding my right hand and trying to make sure that I wouldn’t tell Mother. I never did cry, but she cried enough tears for us both. We finally got to the doctor’s office, but Mother was not there yet. I told the woman in the front what happened and that my mother was coming right away. I said, “It is my head. I give you permission.” The lady just laughed. I looked over to the door, and there was my mother. I sure was glad. I was getting tired of holding that hook up. My arm was worn out. The nurse came out and took us back to a little room. Then the doctor came in and started looking at it. He moved it around trying to get it out. I was thinking, “What a stupid doctor!” I already told him it was stuck. I just wanted it out. He gave me a little shot where the hook was, and he cut it out, I guess. It was just under the skin he said. Then, I get a tetanus shot, and we were all done. By the way, I never cried when I got shots. Margie always did. Mother paid the doctor ten dollars. That was a lot of money for us to spend on a crochet hook. I felt really bad. On the way home, I told my mother I was sorry she had to use money on the doctor for me. Margie just kept looking at me with pleading eyes. I never did tell my mother what really happened until we were grown. I had traveled from Texas to see her, and Margie was there from Las Vegas. We were talking and laughing about it, and we finally told her what really happened, that Margie and I were fighting and she threw it at me. That was one promise I did keep. I would have promised anything to shut her up. Seems like she cried all the time. I really did love Margie though. I loved going with her wherever she went. She was my best friend. She just didn’t know it when we were kids. 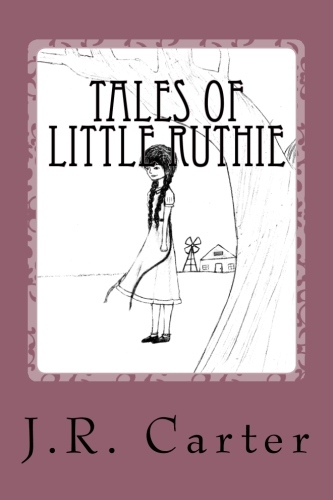 I hope you enjoyed just another day with little Ruthie.